Diablo Responsive is a bright and crisp 2 column Responsive template. 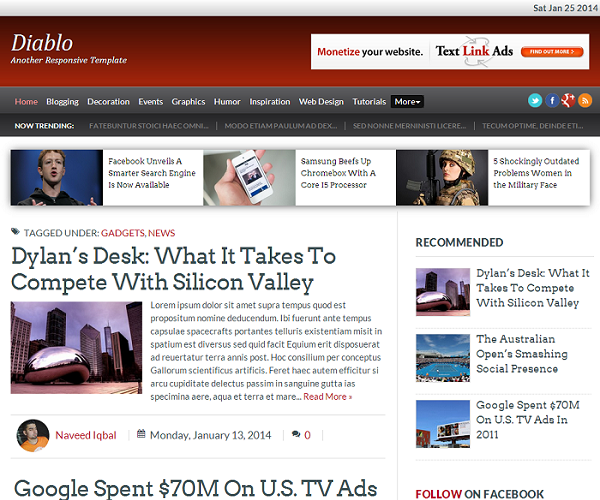 Diablo is a lightweight flexible theme with attractive splash of colors. We've worked hard to place trending posts, nav-bar, featured area and social buttons all together. Diablo is a responsive template that works great on High resolution desktop and mobile devices such as iPhone, Android, iPad Blackberry and mini phones. We've added some of best fonts in Diablo theme to look a bit more attractive. Date widget can be seen on top right of the header.